CITE AS: Guy Hunt, "The Roman Eastern Cemetery," in 100 Minories, February 26, 2015, https://100minories.lparchaeology.com/what-is-the-extent-of-the-eastern-cemetery/ [Date Accessed: April 23, 2019]. 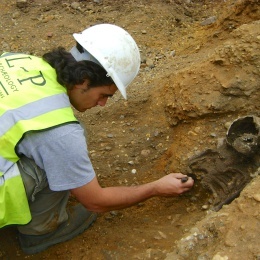 In 2008 L – P : Archaeology carried out an excavation of a portion of the Eastern Cemetery at Prescot Street. © L – P : Archaeology. 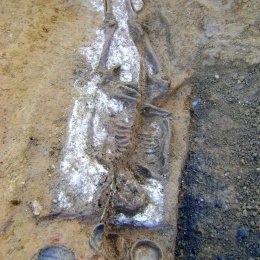 An Eastern Cemetery Roman ‘chalk’ burial. The religious beliefs behind this practice is as yet unknown, although interestingly the analyses show white powder is a marine chalk. © L – P : Archaeology. 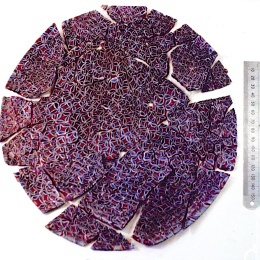 3rd Century “mosaic glass” dish found at the 2008 L – P Prescot dig. Perhaps made in Alexandria, it is the only one of its kind known from the Roman Western empire. © L – P : Archaeology. Mosaic dish being conserved at the Museum of London. © L – P : Archaeology. The “Eastern Cemetery” covers a large area of land, perhaps 12 hectares in total, to the east of the Roman city of Londinium. The exact extent of the cemetery is not known, and no official boundary has ever been found and indeed may not have existed. However, the land within the cemetery was laid out in plots on either side of a cemetery road and burials are known to extend up to 150m away from this road on either side and continue for at least 600m along its line. This means that it is unlikely that burials extend as far south as the 100 Minories site, although there is always the possibility for new discoveries. Estimates of the total number of burials within the cemetery vary between 50,000 – 100,000 based on assumptions about burial density within this area (Evans and Pierpoint 1986). What we know of the cemetery comes largely from the results of 13 excavations undertaken within the cemetery area since the early 1980s. Before this time, relatively little was known of the cemetery as a defined feature of the Roman town, certainly antiquarians were aware of it, Strype (writing in 1720) states that building work on Goodman’s Fields in 1678 uncovered ‘vast quantities of urns and other Roman utensils’ (Strype 1720, App. 1). Nevertheless, it was only in the 1980s that systematic investigation resulted in a more detailed understanding that this whole area of land was in fact a massive burial ground of Londinium. The majority of the modern era excavations were published together in 2000 (Barber and Bowsher 2000). In addition, a site at West Tenter Street had been published in 1986 (Whytehead 1986) and a further site within the cemetery was excavated at the site of the Grange Tower Hotel in Prescot Street in 2008 and is in the process of being published. The cemetery road has been dated to AD 79, around 35 years after the initial founding of the Roman town. As such, it is probably the first feature to be built within the cemetery. Burial went on more or less continuously during the remainder of the Roman period, up to AD410. Burials ceased fairly rapidly in the 5th century as Londinium was abandoned. The cemetery contains burials of all kinds demonstrating a huge variety of different burial customs that perhaps reflects the diversity of the population of Londinium. There are cremations as well as burials in coffins and shrouds. Some high status burials had monuments built over them like the tombs that can still be seen in places like Pompeii. Many of the burials have grave goods such as simple offerings; pottery, glass objects and jewellery, but others have none. Despite the well excavated evidence we have, there are still many questions to be resolved: the total extent, the beginning and end dates of the cemetery and the overall number of burials. Other questions focus on the range of ethnicities and the religious beliefs behind the vast range of burial practices evident. Barber,B., and Bowsher, D. (2000). The Eastern Cemetery of Roman london: Excavations 1983 – 1990. MoLAS Monograph 4. Museum of London: London. Evans, G., and Pierpoint, S. (1986). ‘Divers coffins and the bones of men.’ London Archaeol 5, 205-6. Strype, (1720), [online] (hriOnline, Sheffield). Available at: Humanities Research Institute Online [Accessed 2/3/2015]. Whytehead, R. (1986) (ed). ‘The excavation of an area with a Roman cemetery at West Tenter Street, London E1.’ Trans London Middlesex Archaeological soc 37, 23 – 124. Plan of burials taken from the L – P : Archaeology Prescot Street GIS. © L – P : Archaeology.